In 2002 I began to experiment with ideas on how to bend wood across complex three dimensional planes. In the course of doing this I inadvertently created a tapered elliptical cone shape that, at first glance, looked ideal for a dining table base. After building a prototype of the cone my next challenge was making the top. After heeding advice to "keep it simple" I settled on a pure elliptical oval shape with bookmatched grain and flat edge apron. A 1" high stainless steel plinth was added to the underside of the base. 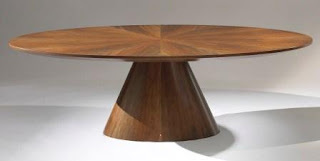 The resulting table was finished in Tobacco Mahogany, and named the Ellipse Dining Table. Although the resulting table looked OK, there was something about it that was just plain missing. What bothered me most was the finish - which was a basic chocolate/mocha/expresso brown. At the time this was a safe finish to use, because just about every professional in the interior design industry was using it in one form or another since it "went with everything". One could probably credit Holly Hunt and Christian Liaigre with first introducing this look to the high end of the market in the 1990s. By the early 2000s, however, the finish was everywhere and I soon realized that to be the main problem. Namely, because of the finish this table was looking like everything else out there - even the cheap dross knock-offs that were now beginning to flood the market by the containerload from offshore. By 2006 I decided to refine the design with some subtle changes. I began by using a wood called Nero Chaquiro, which is a lesser known species that comes from an FSC certified forest in Brazil. In addition to being certified as sustainably harvested the use of this wood also helps support an indigenous community living along the banks of the Amazon River by providing a tangible incentive for the peoples living there to manage their surrounding forest responsibly. The main structure of the table was crafted out of FSC certified ply, which was also NAUF and CARB2 compliant due to the fact that there were no added urea formaldehydes in the glues and binders. To minimize the heaviness of the top the grain pattern was changed to sunburst and the edge profile became a deep undercut bevel. The stainless steel plinth was removed in lieu of a small convex inlay of Narra being added as a subtle detail. The resulting table was finished in a low-VOC water based urethane, and renamed the Ellipse II Table. Taken together these changes created a more sculptural look to the design, and the response from the design community was tremendously positive. 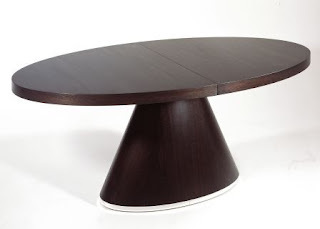 Our ability to custom tailor this design to meet the requirements of each individual client has since resulted in the Ellipse II Table becoming one of our most popular offerings today. 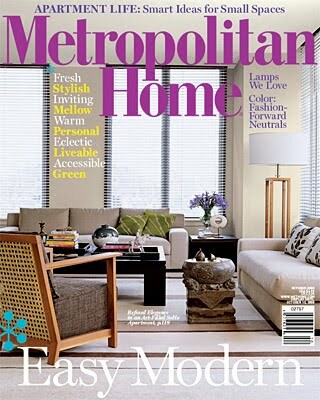 In October 2008 a custom commission of this table for interior designer Wendy Blount was even published in an issue of Metropolitan Home magazine. Thanks to the positive response this article received, the table photo was subsequently republished in the book "Glamour: Making it Modern" by Michael Lassell. Sustainable, Environmental, Eco Lifestyles, Healthy, All Natural, Home and Garden, Interior Design, Eco Friendly, Green Furniture, Green Furnishings, Green Designs, FSC Certified, Reclaimed Materials. Organic, LEED compliant, NAUF. CARB2, Bamboo, Natural Fibers. Non-Toxic, low-VOC, Non VOC, Natural Finishes. Labels: CARB2, custom made furniture, Ellipse II Table, FSC, Glamour - Making it Modern, John Wiggers, low-VOC, Metropolitan Home, NAUF, non-UF, Toronto, Wiggers Custom Furniture Ltd.